Laurelthirst is very much a dive bar. The first thing I noticed upon entering is they have 18 beers on tap. It was breakfast, so I was more noticing, not actually drinking, but I did pick out the one I wanted in my head. It would have been good. I had read ahead and saw that they had lots of vegetarian and vegan offerings. Not to worry they also had other stuff too, but this did catch my eye. I am a meat eater, but I love it when someone can wow me with a vegetarian meal. I love hashes and I have had everything from meat hashes to brussel sprout hashes and everything in between, so the veggie hash caught my attention. This picture does not do it justice on how big this french toast was. 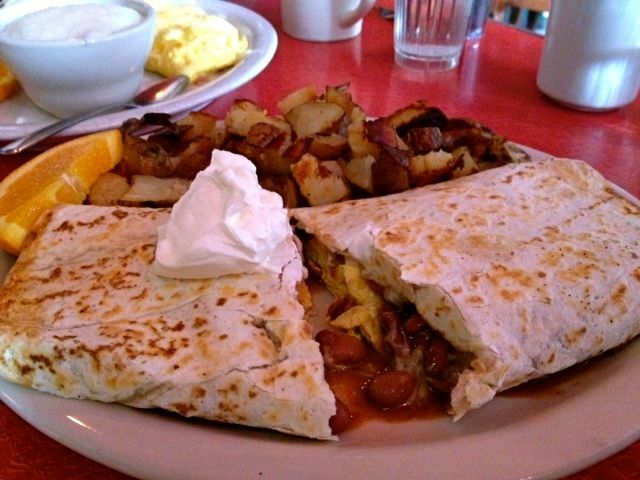 Paul and his friend ordered an omelet and french toast and my husband ordered the burrito. We had quite an array of food at the table. A great sampling if you will. 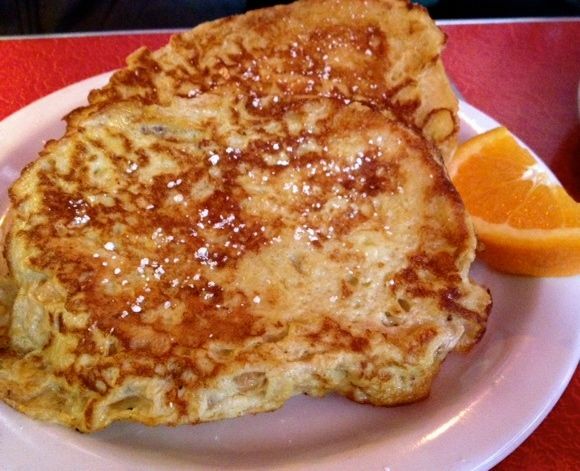 Probably the best looking dish was the french toast. It was huge and the huge portion was a half order. Wow. The scrambles are 2 eggs and the omelets are 3 eggs, so it was a good sized omelet. Veggie Hash. I had an egg added. The burrito was really, really big. It had eggs, veggie beans, salsa, chorizo and sour cream. It had tons of flavor. I am not a huge fan of salsa for breakfast, but it was good. I enjoyed a few bites. 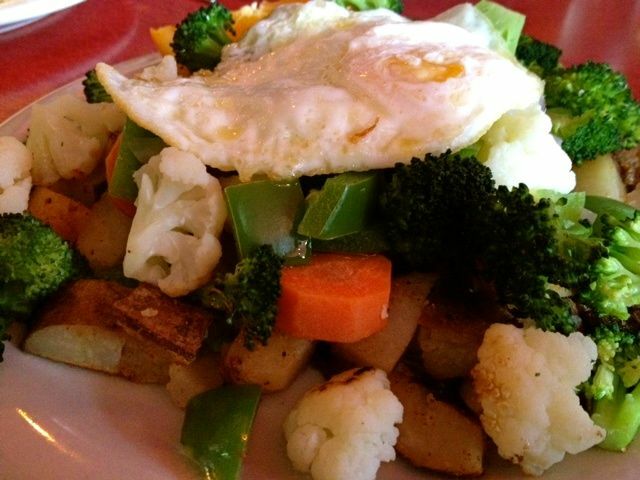 I had the veggie hash, which was supposed to be grilled veggies over the home fries. The veggies were steamed, which is my least favorite way to eat veggies, maybe tossed in the pan so they had some grill marks. I had ordered an egg over easy on top because hashes need eggs. Unfortunately I ordered wrong at this dive bar. Out of all the meals, mine was the least interesting. I was really hoping for something amazing being that they were so vegan and vegetarian friendly. It’s fine though because that burrito was so big, I had some good flavor there. Atmosphere was very much a bar setting, dark, but lots to look at. Pricing was great and they do pride themselves in being affordable food. Service was great. I love that they keep our cups full. The tea was Stash. Not sure what the coffee was, but everyone seemed to like it. Laurelthirst is located on Glisan in the Kerns neighborhood.